The Cooties is a musical comedy trio based in LA. Ethan Edenburg, Eric Jackowitz, and Jacob Jeffries have been friends since before their voices dropped. With backgrounds as professionally trained musicians and songwriters, they blend sketch, music, and mixed media into an unforgettable experience, whether it’s on camera or live on stage. 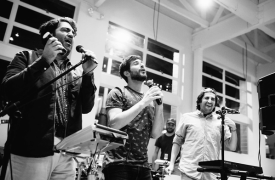 They have very quickly gained incredible momentum in Los Angeles, playing at some of the city's hippest venues including UCB Sunset, The Satellite, and The Resident. The Cooties made a big impression on music/comedy guru Reggie Watts after opening up for him at El Cid. Reggie quickly became a mentor to the guys and they have all performed together many times. Reggie has also lent his talents to videos for The Cooties. Most notably, for a comedy pilot created with JASH and released on Verizon's Go90 named "Dad Friends." The Cooties were featured in 2017’s Just For Laughs festival in Montreal as part of a select group of “New Faces of Comedy” showcase and again in 2018 at JFL and JFL Toronto. They also recently performed live on Conan and at the Kennedy Center before the Mark Twain awards honoring David Letterman. With several projects in development, the guys also hope to see you through your television screen soon. 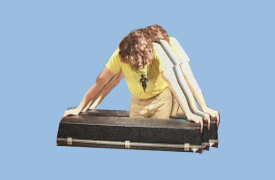 Jack Stratton of Vulfpeck performing as Dr. Morris Grungold.